NOTE: Please be sure to use plenty of leaf and not boiling water to steep this leaf. The leaf is very exposed, being so large and flat, so it is easy to scorch the leaf. The ‘agony of the leaf’ that the British refer to when steeping black tea at a very high temperature (so that when milk is added it will not cool too much) is not a desirable technique when steeping Tai Ping Hou Kui! This is a tea that is highly sought-after every new tea season. NOTE: For 2018 we have had two lots of TPHK that followed one another chronologically. If you ordered this tea early in the season and fell in love with it, please check the website carefully when you place a re-order of this tea because it has changed, and we want you to be aware of that before you receive that second (or third, etc) package. We feel confident that you will like both lots, however they are different one from another, and it is always best to know what is happening! The TPHK that we have on offer now is from LOT #1802, our second lot for 2018. It was manufactured according to the strict Nie Jian standard as described in Mary Lou’s piece that is posted here. The leaf was plucked about a week later than our Lot #1801, which allowed our tea maker to follow the traditional manufacture for the stabilization of the leaf according to the Nie Jian standard. Bob and I visited the Tai Ping Hou Kui tea production area on our first tea buying trip to China in 2000. The core production zone for Tai Ping Hou Kui tea is Hou Keng village in Xinming Township. 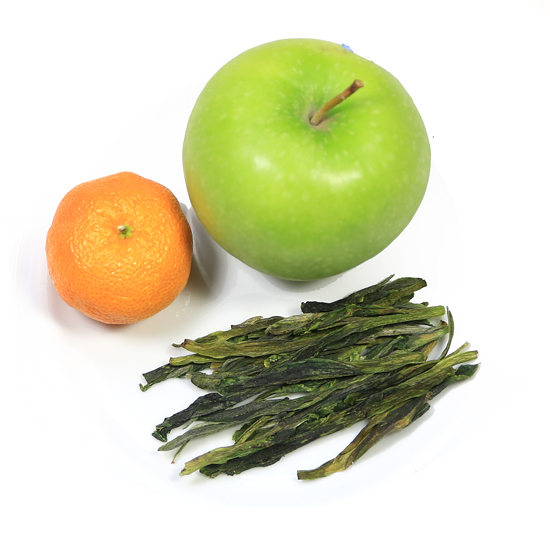 Two nearby villages – Hou Gang and Xian Jia – also contribute to the production. These tea areas are in Tai Ping county, at the southern end of Tai Ping Lake, situated close to the stunning Huang Shan Mountains in Anhui Province. 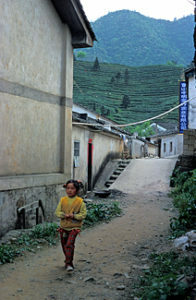 The Tai Ping area is difficult to get to as there are no easy roads for driving to this remote place. For us to reach it, we hired a boat to take us down Tai Ping Lake. There, at the end of the lake, lies a pristine area surrounded by pine and bamboo forests. This is where this glorious tea is made. 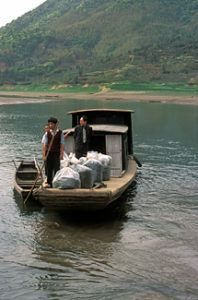 The finished tea departs the village by boat too, as you can see in this photo of large bags of tea that have just been loaded for delivery to tea markets in Anhui and beyond. Tai Ping Lake is a beautiful, man-made lake that supports mixed aqua-culture, and serves as an experimental station for agricultural and aquatic research. The tea gardens are located high in the mountains in areas that generate moisture-laden blankets of ‘clouds & mist’ which keep the plants hydrated and protected from the hot afternoon sun. 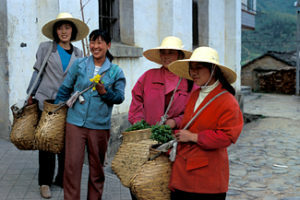 The area sees few visitors – at the time that we visited it was required that we obtain special visas from Beijing to allow us to visit this incredible place to observe the tea production. Tai Ping Hou Kui is one of China’s most celebrated Famous Teas, and is a former Tribute Tea to the Chinese emperor. But today everyone has the opportunity to drink it! 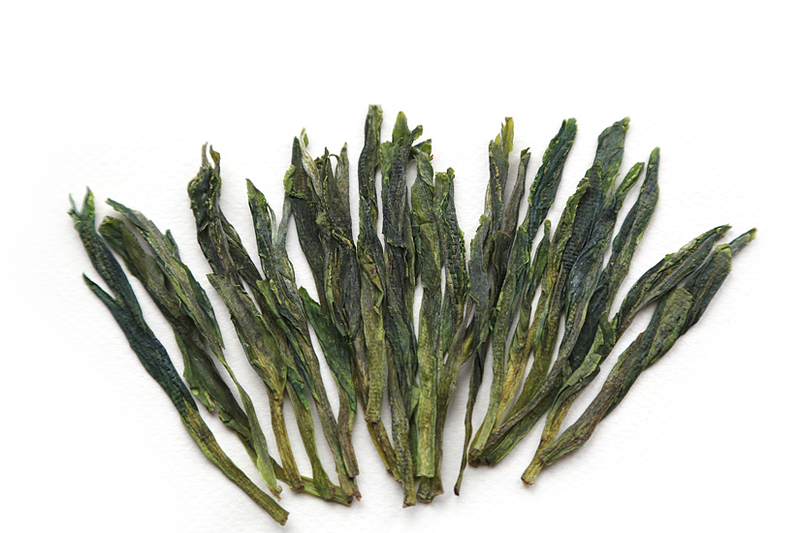 Tai Ping Hou Kui is a large, long and flat tea that is very impressive in size. The size of the leaf has to do with the variety of tea bush cultivar that is grown for Tai Ping Hou Kui (Shi Da Ye ), the plucking standard, and the method of processing the fresh leaf. The plucking standard for this tea calls for it to be made from a bud embraced by two leaves. This tea is one of the few green teas (along with Xi Hu Longjing) that is ‘shaped and pressed’ (by hand or by machine) and not ‘rolled’ (by hand or by machine). 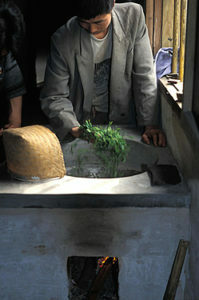 Tai Ping Hou Kui is made three ways and in three villages (see above). The most expensive Tai Ping Hou Kui is Nie Jian from Hou Keng village, then Nie Jian from Hou Gang village, etc. So both production zone and method of manufacture determine price. Li Jian and Bu Jian manufacture are very different from that used for Nie Jian. 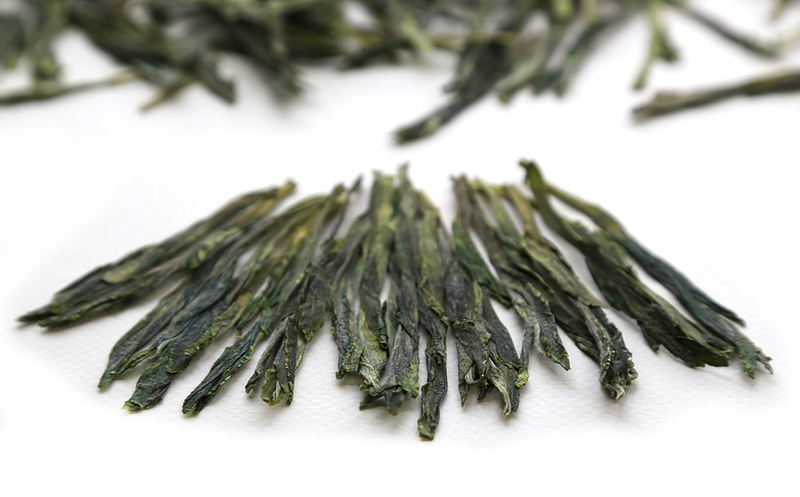 Nie Jian Tai Ping Hou Kui is made from the early spring pluckings that occur over 14 days. But for Li Jian and Bu Jian Tai Ping the tea bushes are plucked on average 7-8 times in a season. If you look at the last picture at the bottom of this page you will see what standard Bu Jian Tai Ping Hou Kui looks like – it is very different looking from the images of the hand-pressed Nie Jian we have again in 2018. This is what most tea enthusiasts experience for Tai Ping Hou Kui, and not our carefully processed, nie jian hand-made tea. Because we observed the production of traditional Tai Ping Hou Kuo 18 years ago (when all the tea was still handmade) we have recently had detailed conversations with our colleagues in China to understand what is causing some Tai Ping Hou Kui to be so varied in appearance: everything from a textured and three-dimensional bundle of leaves to hand-shaped leaf that has been slightly pressed and/or rolled to flatten the bundle to varying degrees, and eventually leaf that is quite flat and stretched due to its having been rolled quite hard. Now we understand – it is the use of mechanical rolling that is an important determinant of the grade of TPHK. Today, the steps of processing are different than they were when we visited the factory by the lake, but the final results are similar within the category of Nie Jian. Overall, the processing tools and the heat source have changed. Then, it was tea firing baskets over low charcoal fires. Today it is fire boxes with controlled and varied temperatures. Because we have no pictures of modern Tai Ping Hou Kui processing, we will share with you our now ‘historic’ images of Tai Ping Hou Kui manufacture. 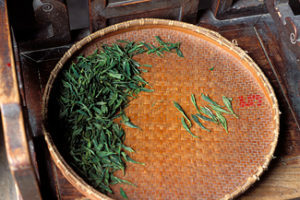 The leaf still undergoes Sha Qing (kill-green) by hand in a tea firing pan (picture below) to reduce moisture and prepare the leaf for pressing/shaping/drying. 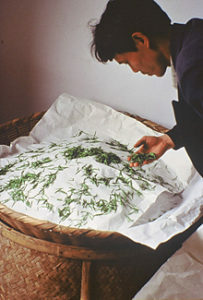 Following this, the leaves are individually hand-shaped and placed on a bamboo tray (today a mesh screen) in one layer not touching other leaves. The leaves are gently pressed by hand to flatten them and take shape. Several tea firing baskets (today these are mesh screens inserted into the fire box at differing temperatures) were heated over charcoal embers of different temperatures ranging from 100 degrees to 60 degrees. The leaf was placed on rice paper in the top of the tea basket for 2-3 minutes and then gently pressed by hand as it sat over the heat. The leaf was moved to each of the different baskets (mesh screens) during this initial firing, and each time the leaf is again pressed by hand until the firing was complete. (Today, leaf is moved to different temperature positions in the fire box and paper is no longer used). Both yesterday and today, upon close inspection of the tea leaf one can see the crosshatch marks from the weave of rice paper (or the mesh screening) embossed on the leaf. So, we are thrilled to have this wonderful Nie Jian Tai Ping Hou Kui for our tea enthusiast customers. We hope to return to the tea factories in Tai Ping one day and update our photo presentation to show the modern-style processing. 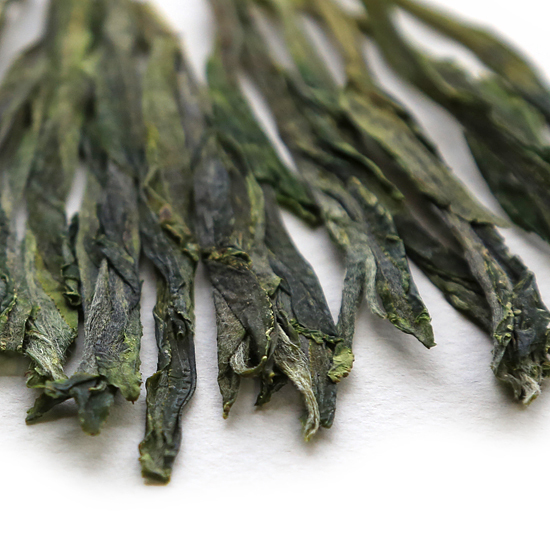 Tai Ping Hou Kui is revered for its clean, elegant, refreshing, very sweet floral taste and deep flavor. The color of the leaf is an unusual blusih-green, and the leaves are full and thick, folded rather than flattened. If you are able to steep this tea in a glass mug or heat-proof drinking glass then you will be able to watch these large tea leaves ‘dance’ in the water as they unfurl. Tai Ping Hou Kui is a large and bulky tea and somewhat difficult to measure by tablespoon. This is one tea that really benefits from being weighed on a gram scale to avoid the disappointment of the inevitable inaccurate measuring of tea leaf this large when done by volume measure. A photo of modern Bu Jian Tai Ping Hou Kui. This is manufactured from later-season leaf that is not hand-shaped but rather rolled ‘hard’ to flatten the leaf – this is not what we have! 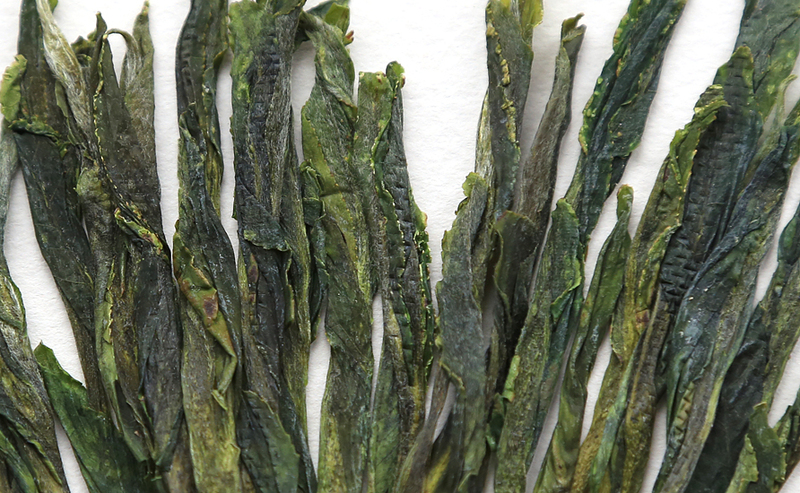 Click on our images at the top of this detail page to view Tea Trekker’s Nie Jian Tai Ping Hou Kui. NOTE: LOT #1802 is now sold out for 2018 – we will not have any further deliveries of TPHK this year. We look forward to the 2019 harvest in late spring (TPHK is normally one of the last of the Spring Green teas to be harvested and ultimately arrive here at Tea Trekker). Look again for this tea in late May and June 2019. NOTE: LOT #1801 is sold out for 2018 – This lot was manufactured to the Nie Jian standard, from as early a pluck as was possible this season; and then the almost-finished leaf bundles were gently rolled to stabilize their shape. This slight rolling was not a critical part of the manufacture, as rolling would be in the manufacture of a Li Jian TPHK, but rather just to ‘fix’ the bundles in their final shape. Looking at the bundles you can see that they were hand-manipulated however there is a slight sheen from the light finish-rolling. They are not stretched or flattened into transparency, as a true Li Jian TPHK would be.